Yes, this is an actual product that was questioned upon inspection (thanks for the pic to a Utah Health Inspector). No, there is no method to make this safe. Yes, you are correct there will most likely be a million cfu/g Salmonella. 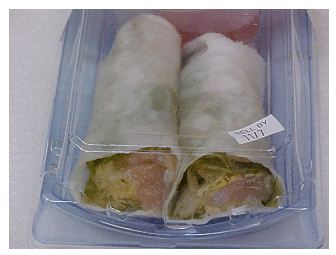 Yes, the customer had to pay extra for the Salmonella (but possibly not in cash). Is this saleable with a menu disclosure of “raw” under the US FDA model Food Code? The answer is a surprising yes. However, a regulator could also prevent its sale without a HACCP plan using 3-502.11 (require a HACCP plan for any dangerous food or process). Can HACCP mitigate the hazard? Hopefully you are answering no.